The best water in Lucerne can be drunk at the fountains of the historical center. Unlike the houses and hotels of Lucerne, the fountains of the historical centre are not fed by pressure pipes, but have their own water supply, which originates in the Middle Ages. 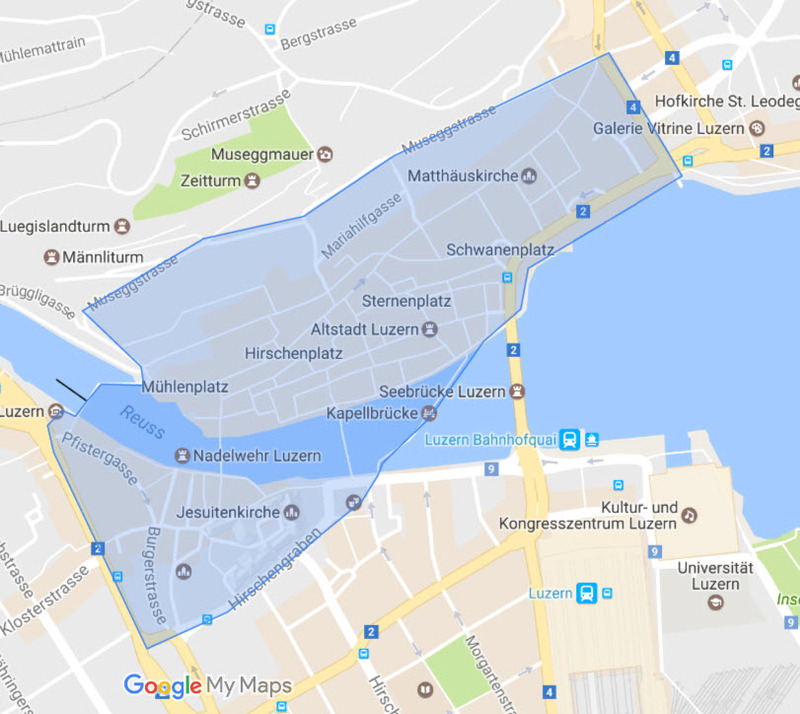 The first fountains of the city of Lucerne were located at the Fischmarkt square (now Weinmarkt), today's Hirschenplatz, at the junction Eisengasse / Schlossergasse and on today's Hertensteinstrasse next to the Restaurant Einhorn. Maybe the first but for sure the finest fountain of the city of Lucerne is located on the Weinmarkt. 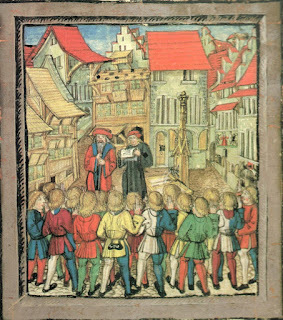 As early as 1332 when Lucerne got part of the Swiss Confederation, a fountain made of wood stood at the Weinmarkt, as you can see on the image of the Diebold Schilling Chronicle on the left. 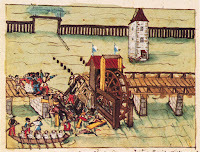 The stone fountain at the Weinmarkt, as seen today, was completed in 1494 by master Konrad Lux ​​from Basel. For this art work he was granted the citizien ship of the City of Lucerne. The original well stock is now exhibited in the historical museum. On the Weinmarkt itself there is a true copy of the work. At the top of the well stands the town patron Saint Mauritius. The six armored warriors show a military demonstration, which took place in old Lucerne in autumn and during the Carnival period. 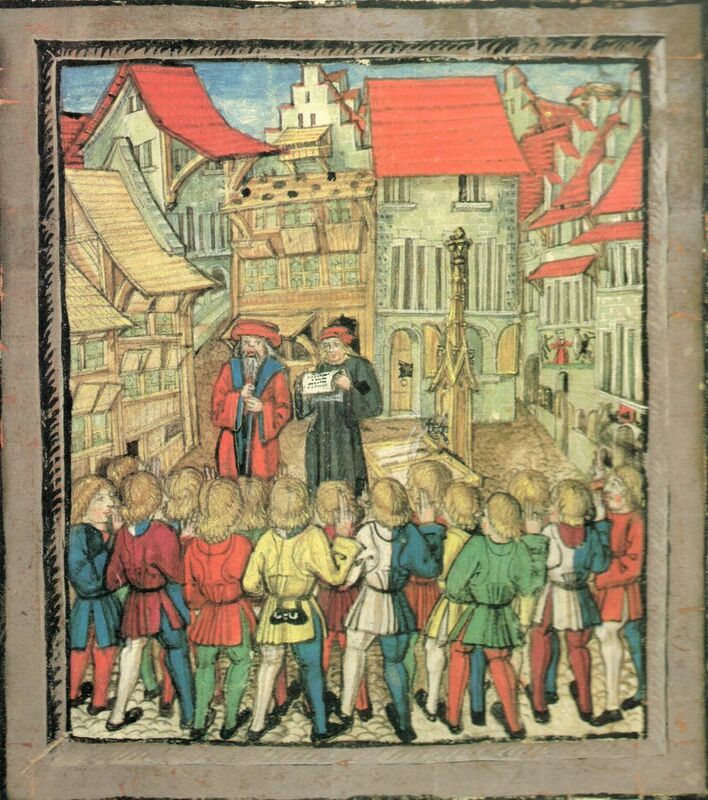 Every citizen of the city of Lucerne had to have weapons and harnesses and show them twice a year in a weapon inspection. 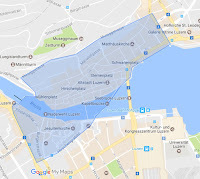 The drinking water for the households, hotels and all buildings of the city of Lucerne comes from two pressure pipes which are fed from a mixture of lake water, ground water and spring water. The quality of the Lucerne Water is very good. But the water of the fountains in the historical center is even better. It consists of pure spring water, which originates from far above the Pilatus near the legendary Pilatussee lake. Already in the Middle Ages the Pilatus spring water was led along the Krienbach crest, under the Reussbrücke bridge, to the old town. While other cities like Zurich drew water from the lake and river, we in Lucerne enjoyed pure spring water. Lucerne's fountain water can easily match the quality of an Evian or San Pellegrino. Further it does not have to be carted from far away. The transport routes are short and environmentally friendly. Another quality feature is the silence of our fountain water, which does not need a pressure line. Water enthusiasts say you should drink the water when it is quiet. At the Lucerne Fountains, you can drink silent water and let this calmness and balance flow into you. The free drinking water of Lucerne fountains is an invaluable asset which must be preserved and protected. Water should not be commercialized. Unfortunately this is not the case everywhere. Therefore: Support the Lucerne non-profit company WasserfuerWasser.ch, which stands for free access to drinking water.